For their sixth album, Procol Harum departed the studio and took to the stage of the Northern Alberta Jubilee Auditorium in Edmonton, Canada, with a full symphony orchestra as their backing band and a 24-voice choir providing vocal support. 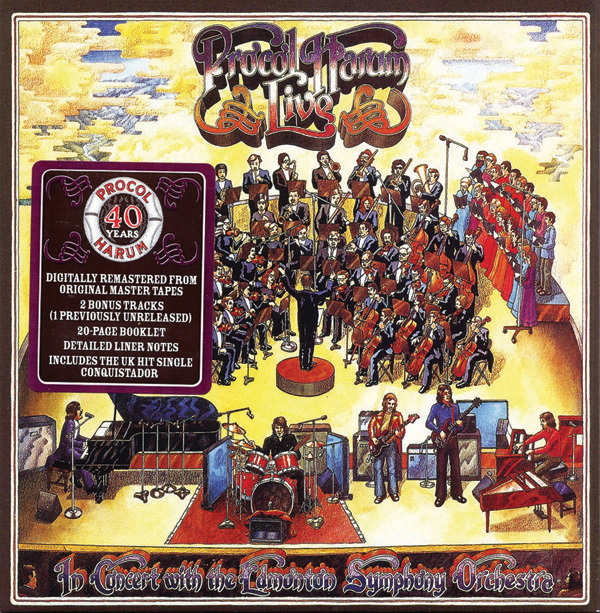 Released in 1972, Procol Harum Live in Concert with the Edmonton Symphony Orchestra (to give it its full, roll-off-the-tongue title) was the result and it finds the band in their natural live habitat, their most ambitious songs up until that time heard in all their symphonic rock glory. Harvesting its yield from the first four albums, Salvo’s reissue of Live in Concert… is a must for anybody who, like myself, thoroughly enjoys Procol Harum’s most excessive outings. I’m talking songs like the magnificently grandiose Whaling Stories from Home, A Salty Dog from the album of the same name and the epically schizophrenic In Held 'Twas in I from Shine on Brightly, all of which are present and correct here. Hearing these orchestral rock masterpieces delivered live with a full accompaniment will send a shiver down your spine, as the full majesty of Procol Harum’s innovative brilliance is given copious space to breathe. Even a track such as the fairly innocuous Conquistador from the début album is elevated to something much more cinematic when treated to such an audacious arrangement. And that’s what this album is all about. Being bold. It’s progressive rock with all the trimmings – flicking the V-sign to the critics that would later dismiss the genre as being overblown. Whereas there’s a certain amount of justification in the accusation of pomposity levelled at some prog acts, this was never the case with Procol Harum. The magnificence of their sound coupled with the sheer power of Gary Brooker’s blue-eyed-soul vocals was always something much more majestic. Live in Concert with the Edmonton Symphony Orchestra is a stunning showcase of this and a band always ahead of their game. The Salvo reissue, as usual, is sexily packaged and complemented by a damn good read in the informative, photo-packed booklet. There’s also three bonus tracks with live versions of Luskus Delph and Simple Sister from Broken Barricades and Shine on Brightly. More reasons – if more reasons were needed – to cop a hold of this album now.